Ecotone is an intriguing collaboration that takes its listener through several zones of sound, all along the way cleaving just enough to Eno’s definition of ambient music, without being immovably adhered to it, to make the comparison valid. 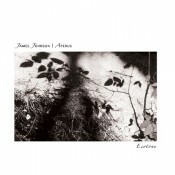 James Johnson and Aperus center their work in that same gracefully deliberate delivery of each note, the sense of airy sparseness that manifests in keeping a respectful if not meditative distance from one note to another. It can be played at an innocuous volume and still retain its strong emotional force, and reveals in close and focused listens an amazing amount of depth and small-sound detail. And on top of all that, it’s flat-out gorgeous, whatever form it happens to be taking at any given moment. The duo improvised and recorded two hours of material in the studio, after which Aperus (aka Brian McWilliams) went back in to work a little remixing/restructuring magic. And so we get, on one hand, Eno-esque explorations like “Crow Over Walnut Canyon,” with echoing piano, a soft underscore of pads, and hints of thunder; or “The Long Goodbye,” with its patient Thursday Afternoon-style keys, raspy punctuations of guitar, and subtle field sounds, all floating on rich pads that roll in like a textbook ambient swell. On another hand, the opener, “Descending Arc,” exists a bit on the shadowy and near-dissonant side in spots. Chimes reminiscent of gamelan clatter and call as bass notes, piano and bird songs fill the space. “The Moth Jar” somewhat follows suit, using a clashing metal sound in places to add that air of dissonance to play against wavering, dream-haze keys. It’s an effective use of the sharp in the midst of the soft, and it’s not overdone. Ecotone is an amazing piece of work. You need to dedicate several listen to just tuning in to the small stuff, the random sounds and field recording, the clicks and hums and clatters that form a sort of sonic scrim hanging in the back. The intricacy at work here is stunning, and more so for the fact that it works at low or normal volume. As a background listen, the pervasive calm–even in the darker spots–works its way into you, and there are points that just make you need to stop and be in that moment. It has a lyrical quality that’s slowly and beautifully meted out. You will end up keeping this on loop. If Ecotone doesn’t make every “Best Of” list out there this year, it can only mean that whomever didn’t include it simply never heard it.